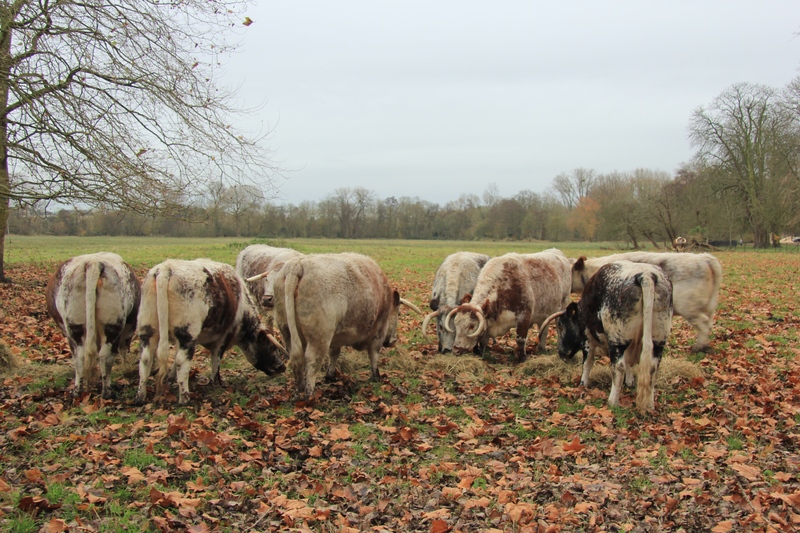 The small herd of English longhorn cows that live on Christ Church Meadow may have one of the World’s most cultured cow pastures. Since my last blog over two years ago I’ve completed a M.S. degree in Anthrozoology at Canisius College in Buffalo, New York and started a Ph.D. in Geography and the Environment at the University of Oxford. My former amateur interest in writing about cattle and their welfare in different parts of the world has evolved into my new role as an academic and cultural geographer. So I find the fortuitous course my life has taken is made even more serendipitous by studying at institutions in two towns named after bovines. Buffalo is a common term for bison–North America’s native cattle–and Oxford means ‘’where the oxen ford the river,’’ which according to the Folly Bridge Café menu is located under the Folly Bridge on the Isis river in heart of Oxford. 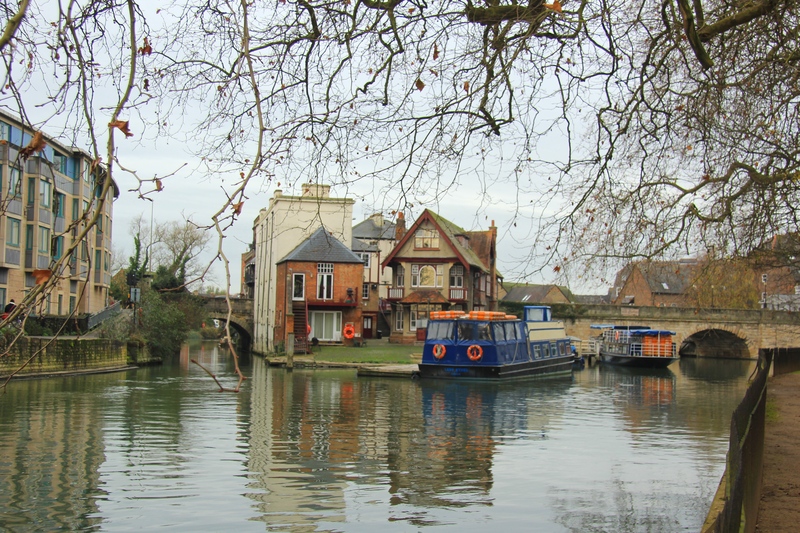 The Folly Bridge–which appears to the right and the left of the building in the center–is the site of the historic “ox ford” that gave the city of Oxford its name. The Folly Bridge and its ‘’ox ford’’ is only a stone’s throw from Christ Church College’s Meadow, home to a herd of twelve English longhorn cows—somewhat famous in Oxford to anyone who has taken a stroll or jog around The Meadow. This expanse of openspace is framed by Christchurch College to the North, the Themes river (locally known as the Isis river) to the south, the Cherwell river to the east and Abingdon road to the west. Circumnavigating its 2.5 mile perimeter is a very pleasant journey. 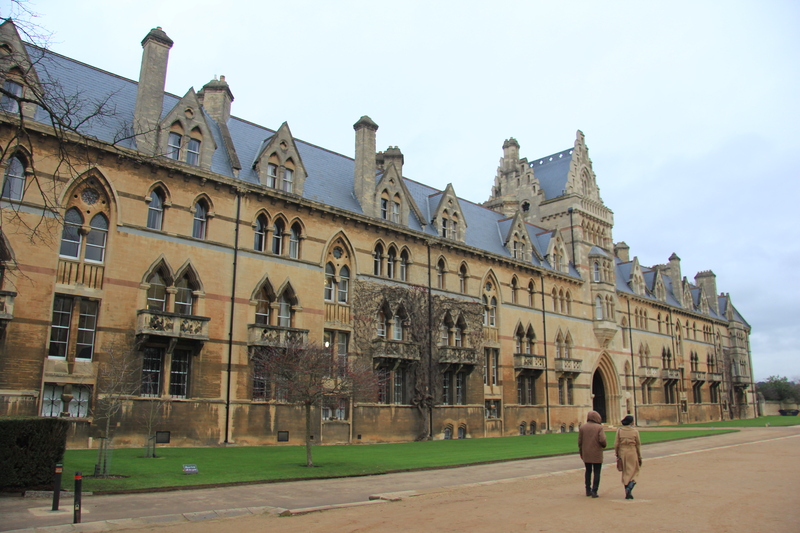 Christ Church is arguably the most famous of Oxford University’s colleges* and is visited by many tourists. The majority of tourists go to see the dinning hall which served as the inspiration for Hogwarts dinning hall in the Harry Potter movies; Christ Church Cathedral, which is a point of historic interest also holds Evensong–a sung evening mass–every week throughout much of the year; and the college’s small but impressive fine art portrait gallery. But unlike the other attractions at Christ Church The Meadow is free to visit and open to the public during daylight hours. 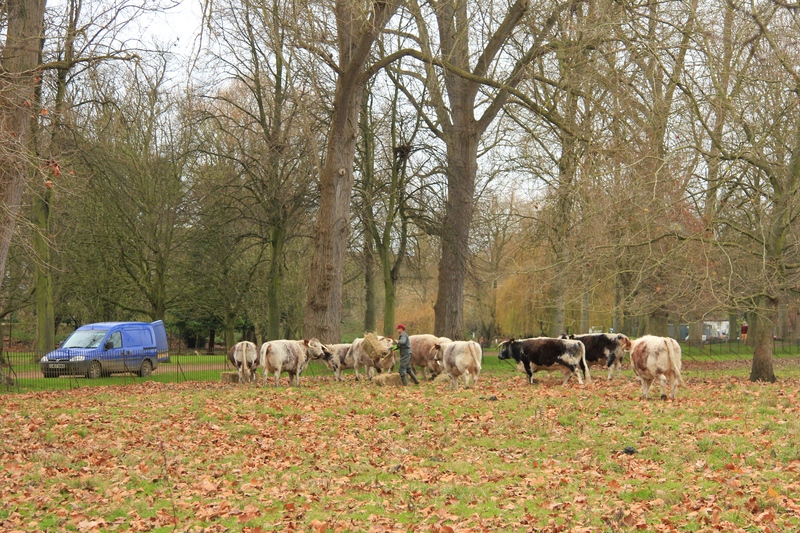 To residents, tourists, and students The Meadow can be a calming oasis adjacent to the busiest part of Oxford and the cows certainly enhance this open space’s pastoral presence in the heart of the city. This entrance on the north side of The Meadow admits tourists–for a fee–into the most historic parts of Christ Church College. The meadow in the early morning winter sunlight nearly gives the illusion of being in the countryside. 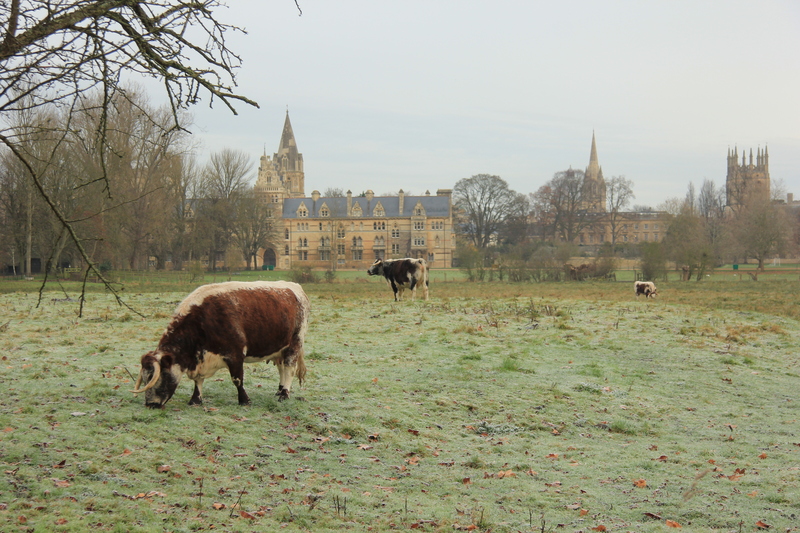 Since moving to Oxford I’ve been curious about Christ Church’s cows, who tends to their care, and why the college keeps them. This week I had all my questions answered by Mr. Charlie Gee, a second generation family farmer employed by Christ Church to manage the herd. Charlie runs Medley Manor Farm in nearby Binsey, which in addition to a herd of around 150 beef cattle has a pick-your-own fruit and asparagus farm during the summer. His own Aberdeen Angus cattle occupy other fields in and around Oxford, some with walking paths frequented by residents, such as the Themes path north of Oxford and fields in Marston. Charlie asked me to meet him at The Meadow to chat while he looked after the cows. The cows spotted him before I did and quickly trotted up to his small blue van as he pulled out two bales of hay, tossed them over the fence and scattered them throughout the herd. Charlie has a warm and open demeanor and a calm presence–exactly the type of person good at working with animals–and I soon got the impression he enjoyed his job. Farmer Gee feeding the longhorns. As we watched the cattle jostle each other around and settle into eating their respective piles of hay we settled into our conversation. Charlie described the cows as very docile to humans, but a bit rough with each other as they continually work to establish the herd’s pecking order. The college keeps cows on The Meadow to maintain and fertilize the field and for general ‘’aesthetic reasons.’’ The cows are removed from the field in the winter to Medly Manor Farm—usually sometime in December—to give the field a rest, provide them access to shelter and give Charlie and his partner Pete the chance to tend to routine health maintenance of the herd. 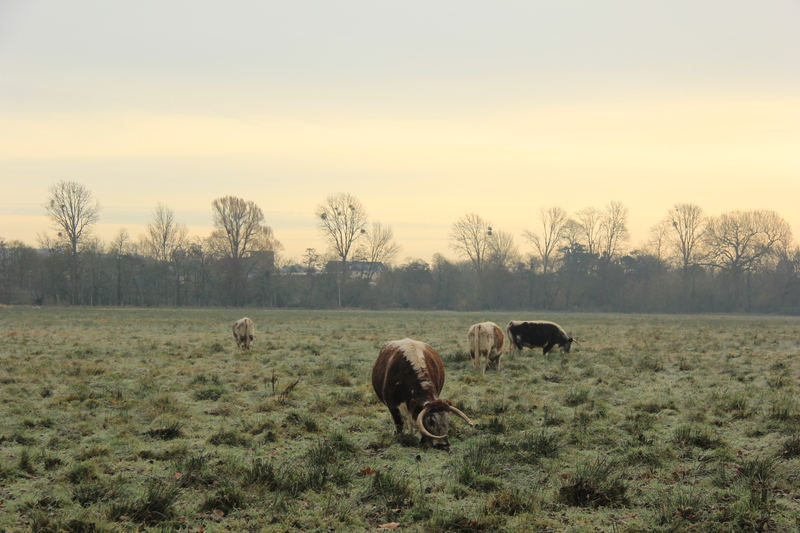 The field also serves as a floodplain and since flooding is unfortunately becoming a more frequent occurrence in Oxford during the wintertime it also ensures the small herd will be safe during extreme weather conditions. Unlike Medley Manor’s beef herd, these twelve cows are not used for beef or for breeding purposes—though the occasional longhorn steer (a castrated male) is kept in the herd to be used for beef by the college for events like The Tenants Dinner, in which farmers that lease the colleges agricultural properties—both arable and grazing lands—are invited to dine at Christ Church for a meal in their honor. The rest of the herd is not intended to be used for beef. Their only job is to graze the meadow and enhance the college’s aesthetic appeal to those living at and visiting the college. Though their large size and long horns make them look formidable longhorns are docile and friendly cattle. Taken during the “Summer Eight” boat races on the Isis River, which captivated cows and children alike. 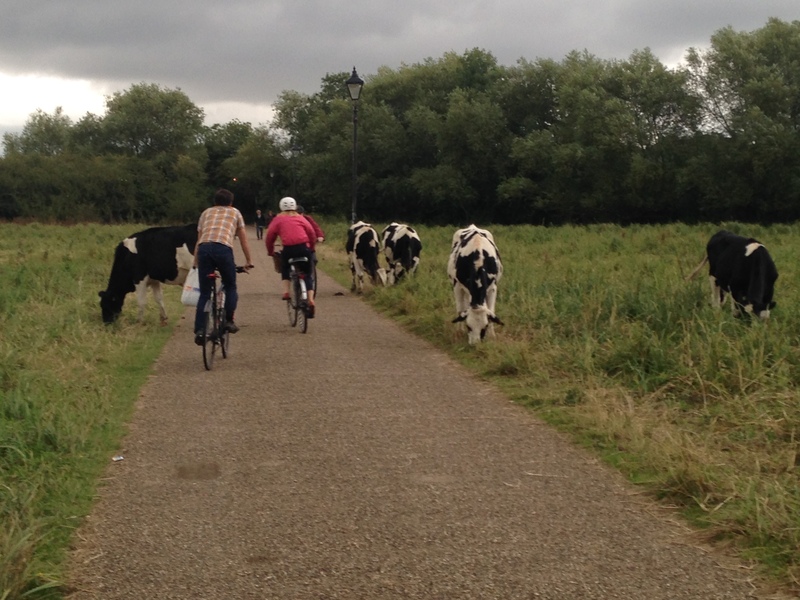 Cows are not uncommon to interact with in Oxford’s many open spaces. 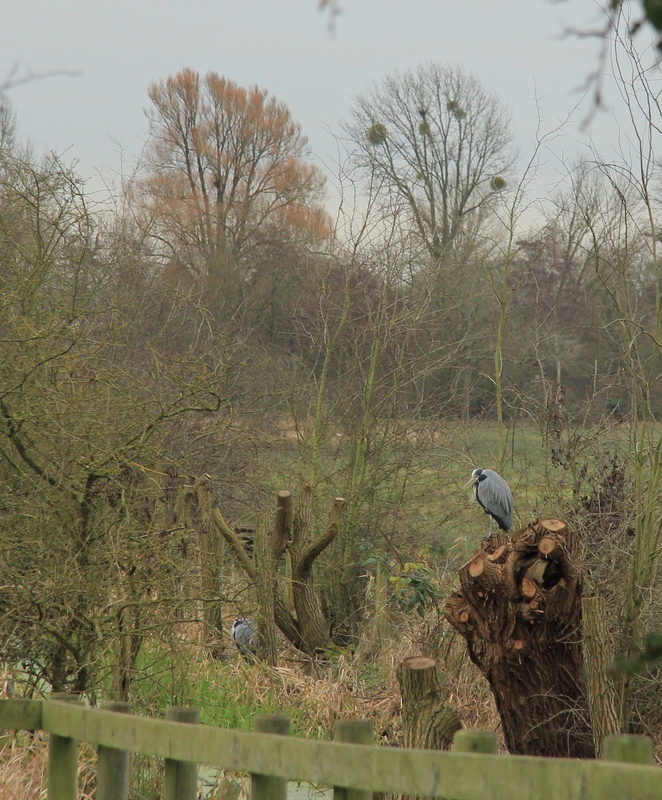 This photo was taken on Marston Meadow. The cows were chosen for their unique aesthetics—long curving horns—and for their native attributes as easy keepers and as cows adapted to the British weather and landscape. A small selection committee representing the college–comprised of Charlie, the former Dean of Christ Church (who retired last year) and the current Treasurer–purchased the cows at the Longhorn Breeder’s Sale at Worcester Livestock Market. The English longhorn is an iconic British breed that are associated with Sir Robert Bakewell, Britain’s famous agronomist who made advancements in the practice of selective breeding of livestock during the 18th Century. Before Bakewell developed these new methods it was common for farmers to keep male and female livestock together, which caused traits to be inherited in a more random fashion. Bakewell standardized the practices of keeping male and female livestock separate, which allowed farmers to choose only males and females with desired traits to be bred together. He also pioneered in-breeding–breeding genetically related individuals together–as a method to increase the inheritance of desired traits. Because of these methods within sixty years cattle farmers increased the size of a British bull sold at market from an average of 380 lbs (168 kg) to 840 lbs (381 kg). 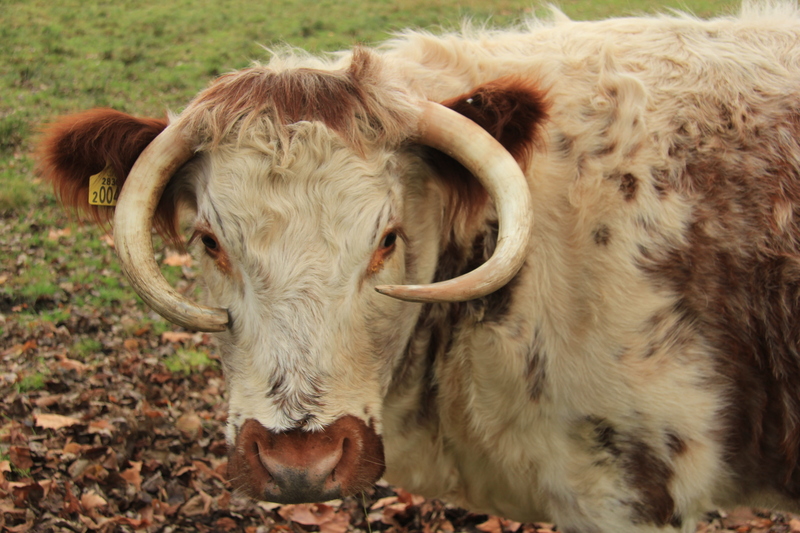 English longhorns were originally a draught breed, used for farming and transport, until Bakewell chose them as the first dedicated beef breed because of their size and ability to gain weight. Though not considered an industrial breed today, Bakewell’s “Dishley” longhorn was the first breed designed as a dedicated beef breed during Britain’s agricultural revolution. They are still a somewhat popular breed for native breed and grass-fed beef enthusiasts. The Rare Breed Survival Trust lists longhorns as a breed with more than 1500 breeding females and therefore not a vulnerable or endangered breed in England. “Dishley” Longhorns were Britain’s first breed developed by Sir Robert Bakewell in the late 1700’s for what would become England’s beef industry. The longhorns with a view toward Christ Church Cathedral. Like many things at Oxford, the longhorns represent a cultural narrative about the history of Britain, a history that continues to inform Western ideals of a desirable and civilized life. 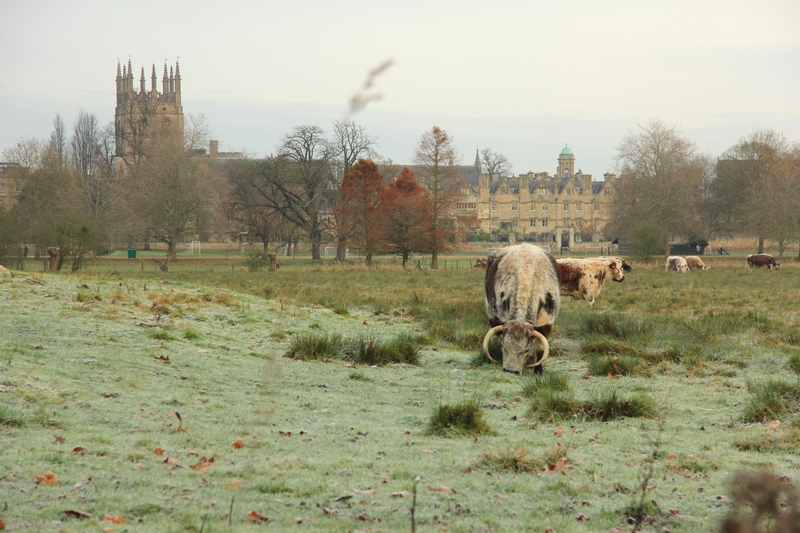 With the Oxford skyline framing Christ Church Meadow, the cows themselves appear to be living a most civilized life indeed but in The Meadow these cows are in their perfect context. They are a breed perfectly adapted to their environment and in a circular farming system they spend the winter eating hay grown on The Meadow earlier in the year. It is a pleasure to see cows that are adapted to their native habitat living in a manner that provides them ideal welfare. Not only do the cows have Charlie and Pete to check in on them daily, there is a constant stream of students, residents, and tourists observing the cows and occasionally calling Charlie if they think something is amiss (which there rarely is). If only many other cows in the rest of the world were as lucky. Special thanks to Charlie Gee who was kind enough to speak to me for an hour in weather that made a heron on The Meadow look this cold. *Colleges at Oxford (and Cambridge) are communities that students and faculty belong to outside of their home department at the University—similar to the different houses at Hogwarts in J.K. Rowling’s Harry Potter series. 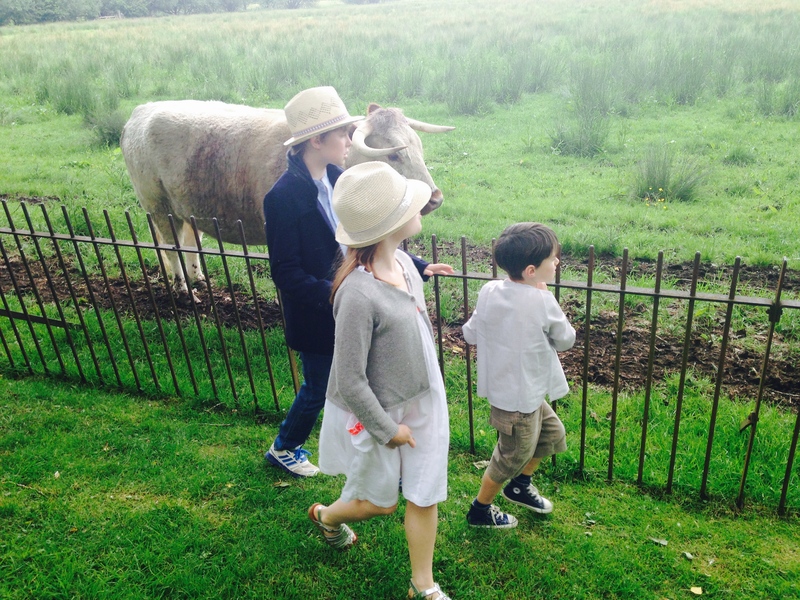 This entry was posted in United Kingdom and tagged Christ Church Meadow, English Longhorns, Longhorns, Oxford, Oxford University. Bookmark the permalink. I really enjoyed your post – very interesting! One off the wall question – What kind of bird’s nests are in the trees? Thank you, Duane. I don’t know what kind of birds those nests are from. i’ll find out and let you know. I don’t think they’re birds’ nests, but balls of mistletoe! Thanks, Sally! A very festive answer to Duane’s question. Duane, We have an answer to your question, thanks to a fellow commenter. Not bird nests, but mistletoe! I thoroughly enjoyed your blog, and interested in your academic pathway. The world needs scientists in every field, and yours is delightful. I fully expect that in your future, you will have a National Geographic story that follows your interests. I will share your story with Katie. She will be interested in your story. Thanks very much for your kind words and support, Muff. It’s so nice to hear from you. Hope you and your family are well and hello to you and Katie.